This striking bronze winged victory figure was created by Carl Augustus Heber (1875–1956) and dates to 1923. 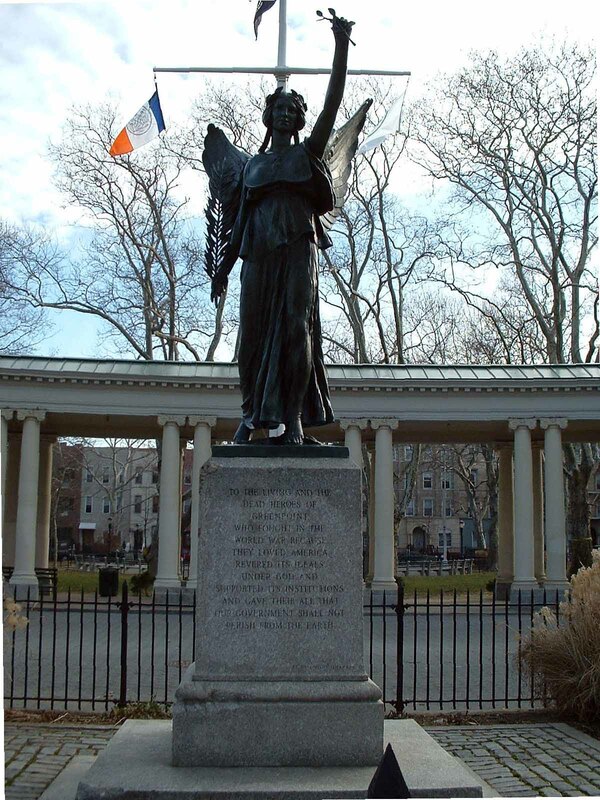 The monument honors those valorous residents from the Greenpoint community who fought in World War I. The statue depicts a female allegorical figure, holding aloft a modified laurel, symbol of victory, and in her right hand supporting a large palm frond, symbol of peace. The granite pedestal is inscribed with the names of battle sites in France. 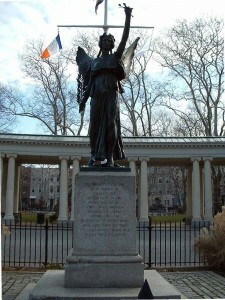 The monument was commissioned at a cost of $7,300 by the Greenpoint Memorial Association. Heber was born in Stuttgart, Germany, on April 15, 1875. He studied art at the Academie Julian and Écoles des Beaux Arts in Paris, France, as well as at the Art Institute of Chicago in Illinois. He was made a member of the National Sculpture Society in New York City, and was awarded commissions for public works in New Jersey, New York, Wisconsin and Illinois. His other sculptural works include Pastoral in the St. Louis Museum of Fine Arts, Benjamin Franklin at Princeton University, and Roman Epic Poetry in the Brooklyn Museum. In 1937, Parks’ monuments crew repainted and reset the sculpture. 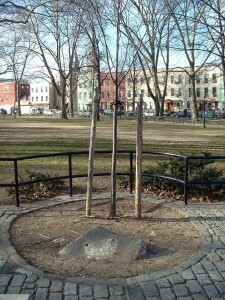 In 1962, Christmas trees placed around the monument then set on fire, this caused damage to the base. In 1975, vandals stole portions of the palm frond, and in 1976, toppled the sculpture. At that time Parks’ monuments crew repaired and rewelded the wings, and again reset the artwork. 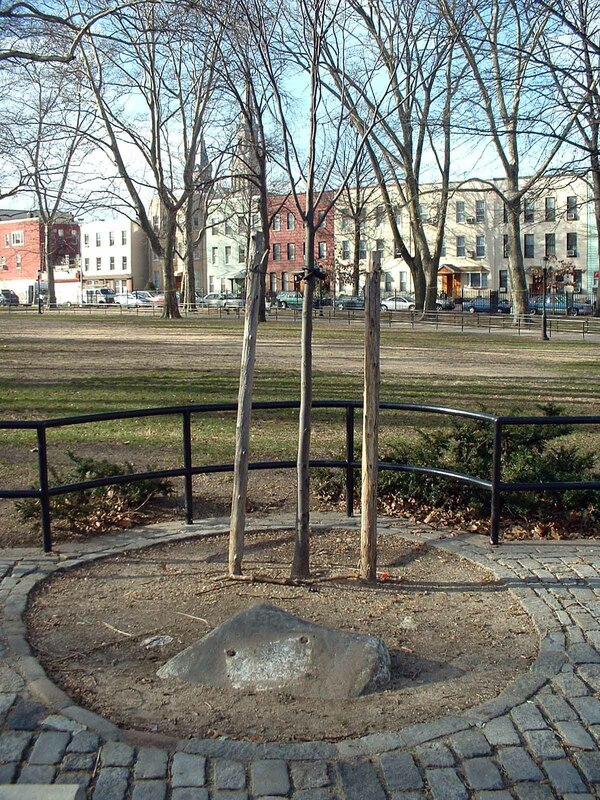 In 2000, the City Parks Foundation Monuments Conservation Program refashioned the missing palm frond and laurel, evened the surface patina, and cleaned and conserved the monument. The project was funded by the Florence Gould Foundation, the American Express Company, and the Samuel H. Kress Foundation. The Plaque which is pictured below at one time was attached to the stone, pictured above. A passerby noticed an individual trying to steal the plaque. The person turned the plaque over to the Post. The Post is currently working with the Parks Department to re-attached it to the stone.